Busy weekend! The final surprise for January 2010 is the addition of book search to the book tracking page. 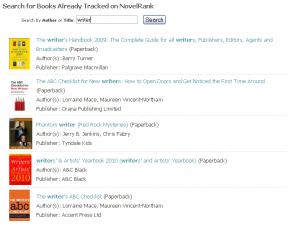 You can now search all the books tracked on NovelRank to see if yours is already tracked. Of course, if you know your book is tracked, but have no idea how to get to it, you are welcome to use the new feature as well. It’s a custom built search, so it will look for the most exact match first before going into a ‘looser’ search. Search by title or by author, your choice. Now, if you are just curious, you could just search and see what comes up! You never know what amazing independent book you may find! Start searching for books right now. This entry was posted in News and tagged search on January 25, 2010 by Mario Lurig. Hi we are publishers with more than 100 books in print. Could we just upload an excel spreadsheet with the ISBN numbers in it? The one-at-a-time interface is great for self-publishers but not for us. Any help appreciated. Here’s a link to the blog post I did about your site on CreateSpace. It’s had 308 page views so far. This is really a great set of tools for authors and publishers. I’m really looking forward to watching you develop it further. I particularly like the ability to use twitter search for titles. Brilliant and forward thinking, since none of the other tools out there have has as many features Following you on Twitter and FB now. Cheers! Can you add my book?